Get a royal Garland welcome with Tikka and turban on your forehead. Enjoy a welcome drink. Delhi, the Capital city of India is known for its rich history and culture. It was ruled by the Mahabharata rules in the ancient times and the Rajputs in the medieval days before it was invaded by the British. The tour begins in the evening with a grand welcome aboard the train at Safdarjung railway station. Get introduced to your fellow travelers. Explore your new palace and acquaint yourself with its world-class facilities. Enjoy a drink at the bar. Dinner on -board its 2 restaurants. Arrival in Jaipur. Sightseeing starts with a visit to the Hawa Mahal (Palace of Winds) followed by the Jantar Mantar - an Astronomical Observatory. The next visit is to the City Palace Museum. Jaipur also offers a great shopping experience. You can shop for some amazing handicrafts that you get nowhere else in the world, excellent-quality gem-stones, hand-clock printing fabric, etc. Relish lunch at the Amber Fort. Enjoy a ride on the back of a decorated elephant to go up to the fort. Post lunch, explore the fort, a perfect blend of Rajput and Mughal architecture styles. Visit Sheesh Mahal at Jai Mandir. Back to the train by bus to freshen -up. Later, relish lip-smacking dinner in one of the best hotels of Jaipur along with a cultural performance. Return to the train. Ranthambore tiger reserve, at the junction of the Aravali and the Vindhyas, is an amazing mix of natural and historical richness. It is located around 14 kms from Sawai Madhopur. Along with a diverse wildlife, another attraction here is the 1000- year old Ranthambore Fort, atop a high hill. The national park houses three big lakes- Padam Talav, Malik Talav and Raj bag. Though a delicate eco- system, Ranthambhore is dynamic in the diversity and density of fauna it supports. Tiger sighting is always a matter of chance, though evidences of its activities are equally exciting. You may also have the opportunity to see 24 different species of mammals including spotted deer, sambhar, wild boar, Indian Gazel, Jungal cat, Panthers, Jackal, Hynas Rarely sloth bears and around 300 avifauna species. Breakfast is served in Hotel Vinayak. Later, indulge in sightseeing. Visit Jhoomar Baori- the hunting lodge Of King Sawai Madho Sing and Jogi Mahal- a former guest house. 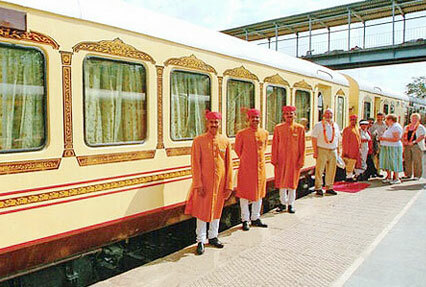 Back on-board Palace on Wheels. Lunch on-board while enjoying the beautiful scenery passing by. 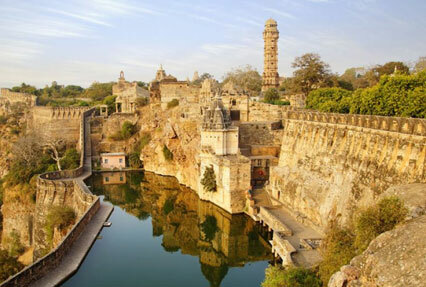 After arrival in Chittorgarh, explore the Chittorgarh Fort, considered as the largest fort of India. Covering an area of around 680 acres of land, it was constructed between 5th and 8th centuries. Although now in ruins but the fort has not lost its magnificence. 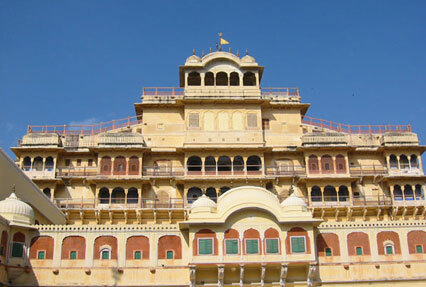 Rana Kumbha Palace and Padamini Palace in the fort are considered as masterpieces of Rajput architecture. Padmini Palace had been the residence of the beautiful queen, Rani Padmini. Once you arrive in Udaipur, explore the Lake City. Enjoy breakfast at Shikar Bari- A hunting lodge of the Mewar ruler, a calm place to enjoy breakfast with nature. The first visit of the day is the massive City Palace whose foundation was laid down by Maharaja Udai Singh on an island of Lake Pichola. Have lunch at Sunset point- an open -air restaurant where you can enjoy a view of Lake Palace and Jag Mandir while enjoying the fresh breeze coming from the lakeside. Later, visit Crystal Gallery- a balcony of Fateh Prakash Banquet hall having a museum that consists of crystal glass furniture, crockery, chandeliers of old time etc. Boat Ride and back to train. Arrive in Jaisalmer -The golden city that has a charm of its own. It was founded by Rawal Jaisal, a Bhati Rajput ruler in 1156 AD. You visit the Jaisalmer Fort, also known as the Sonar Quila, made of yellow sandstone. It boasts of being one of the largest forts in the world. The other major attractions of the city are its old mansions (havelies). Patwon Ki Haveli, Nathmalgi Ke Haveli and Salim Singh Ji Ki Haveli have the most striking architecture that is a fine blend of ancient and the medieval architectural styles. Enjoy shopping and lunch at Moomal Hotel where you are served mouth-watering Rajasthani delicacies. 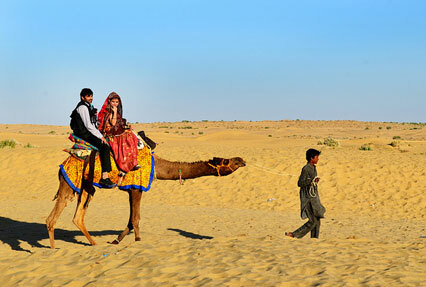 Later, enjoy a camel ride in the Thar Desert. The ride comes to an end at the Sam sand dunes. Evening Tea, Sunset and Dinner with Bar-be-que, at Sam Dhani. Special welcome on arrival in Jodhpur. . The city, best known for its indigo-hued homes and buildings, Jodhpur is the former capital of the Marwar. The first visit of the day is Mehrangarh Fort – one of the largest forts of India. It was erected by Rao Jodha in 1459 and later his successors also added new structures. The fort is situated 120 meters high on a hill. Later, indulge in shopping of handicrafts from the local bazaar. This is followed by lunch at the Umaid Bhawan Palace, one of the world’s finest and largest palaces with extremely beautiful rooms. Still home to the royal family, the fort also houses an old clock museum. Explore the beautiful palace. Back to Palace on Wheels. Dinner on- board. Bharatpur was a kingdom where the jats, rather than the Rajputs, ruled. Bharatpur’s Jat History is not too old, with Suraj Mal establishing a firm stronghold in a region contested by both the Rajputs and the Mughals. 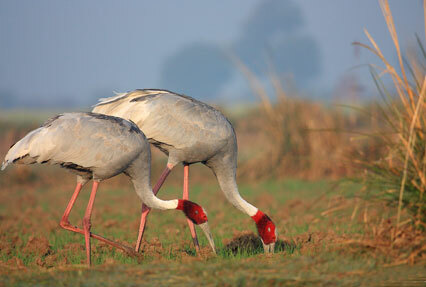 Visit the Keoladeo Ghana National Park, formerly known as the Bharatpur Bird Sanctuary. It is one of the finest bird sanctuaries in the world. During bird watching, you can spot more than 300 avifauna species. Its shallow, fresh water marsh attracts thousands of migratory birds. 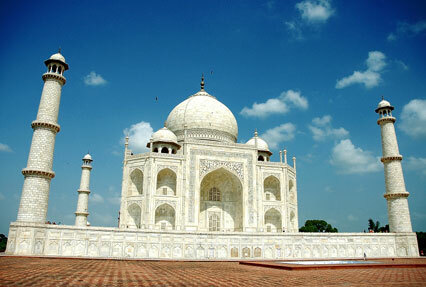 On arrival in Agra, visit one of the world’s most well- known monuments, the Taj Mahal. It was built by Mughal Emperor Shah Jahan in the memory of his beloved wife Mumtaz Mahal. The Taj Mahal is the perfect finale to your Royal Sojourn. Have lunch at Palace Hotel. The evening is scheduled for Light and Sound culture program, followed by a Gala Dinner at Hotel Mughal Sheraton. Arrival at the Safdarjung railway station. An on-board breakfast at around 7:30 A.M., followed by checkout and farewell formalities. A 10% surcharge is to be levied on all Christmas and New Year departures (25th December and 1st January respectively). GST of 5% on the tariff. Commercial Tax of USD 15 per person is applicable in addition to the tariff. 10% of the tariff (without beds) for children less than 5 years. 50% of the tariff for children between 5 and 12 years. At the time of confirming the booking pay 20% of ticket value. 60 days prior to departure pay the remaining 80% of ticket value. 95% of ticket value is returned if cancelled 60 days before departure. 80% of ticket value is returned if cancelled between 45 to 59 days before departure. 50% of ticket value is returned if cancelled between 30 to 44 days before departure. No refund if cancelled less than 30 days before departure. 95% of ticket value is returned if cancelled 89 days before departure. 50% of ticket value is returned if cancelled between 31 to 88 days before departure. No refund if cancelled 30 days before departure. In case of No Show / Non-arrival of the guest, no refund or adjustment in future travel will be possible. The whole amount shall be treated as forfeited. In case of termination of tour by the guest, for any reasons, no refund or adjustment for future travel will be possible. The amount for unused portion of the tour shall be treated as forfeited. Is only possible under the circumstances like Natural Disaster / Natural Calamity or Serious Health Problem's (this needs to be supported by doctor's certificate) and is subject to availability. No refunds are possible and every case be decided on merits on a case to case basis. The Palace on Wheels schedule for the season between September 2019 to April 2020 has been given below for your read through.